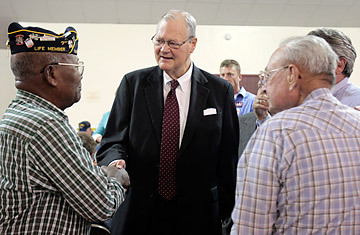 Democratic Representative Ike Skelton of Missouri speaks to prospective voters at a candidate forum in St. Robert, Mo. Ike Skelton, the powerful chairman of the House Armed Services Committee and a 34-year veteran of Congress, is a rare breed of Democrat. He managed to survive, even thrive, in a conservative district as Republican waves crashed over him, starting with the one stirred up by an outsider named Ronald Reagan. Not this time. In his 17 previous battles for Congress, Skelton never won less than 62% of the vote in his largely rural 4th Congressional District, which is east and south of Kansas City. But on Tuesday night, drowning in a sea of anti-Washington anger, he captured just 45%. Republican Vicky Hartzler, who tarred Skelton as a big spender who had lost his moderate roots, somehow beat the old bull with 50% of the electorate. Skelton wasn't the only venerable Democrat swamped by the Tuesday tsunami. House Budget Committee chairman Jack Spratt of South Carolina lost his seat. House Energy Subcommittee chairman Rick Boucher of Virginia was dumped. Like Skelton, they were moderate, pragmatic Democrats in districts that appreciated their skills and tolerated the D behind their names. Their defeats moved the country another step down the road toward ideological polarization. "This district has been fed up and fired up and ready to stand up, and we did," Hartzler told her cheering supporters. A former home-economics teacher who served six years in the Missouri legislature, Hartzler ran the 2004 campaign to ban gay marriage via the state constitution. In this year's midterm-election campaign, she was Tea Partycertified and Sarah Palinapproved. As for Skelton, 78, his concession was plain and graceful, befitting his reputation. It marked the end of a half century of political life; he was just 17 when he attended the Inauguration of a fellow Missourian by the name of Harry S. Truman, who later urged Skelton to run for Congress. Skelton first served a stretch as a county prosecutor and then joined the state senate. In 1976, he finally followed the former President's advice, easily winning a seat in the House of Representatives, where he began the long, slow work of building seniority and clout. Eventually, Skelton brought the B-2 Stealth bomber to Whiteman Air Force Base and quadrupled the number of military trainees cycling through Fort Leonard Wood in the shadow of the Ozarks. Some 40,000 civilian jobs are said to hinge on those feats of legislative power and persuasion. Many now wonder if those installations will survive the next round of base closings with Skelton gone. But for angry voters, none of that mattered. "It's a crazy year," lamented one well-placed Republican who has long supported Skelton. "I ask people, What about his seniority, what about everything he's done for Missouri? They don't seem to care. They just think it's time for a change." Hartzler tirelessly traveled the 4th Congressional District's 15,000 square miles, through farmland and low-slung towns, hammering Skelton for backing the stimulus bills, the bank bailout and the cap-and-trade bill. "Ike Skelton is not standing up for us anymore," Hartzler told TIME before Tuesday's vote. "He's changed. We don't believe in runaway spending ... or the Nancy Pelosi, job-killing, radical agenda. That's not just a Tea Party thing. That's [also] a conservative, 4th District values thing." To the end, though, Skelton's supporters believed that he would survive again. "Our folks would be nuts not to re-elect Ike," said Jane VanSant, chair of the local Democratic committee in Johnson County, home to Whiteman Air Force Base. "He's not a real good Democrat  he's at least half-Republican. But he's really brought it home for this district." At a county library on Monday, not far from his home in the Civil War battlefield town of Lexington, Skelton was upbeat as he met with supporters. But he knew even before the votes were cast that he was in for the toughest race of his career. "The atmosphere," he said in a gentle voice. "The economy and the uncertainty that goes with it. The loss of jobs ... But people have been good to me, very good." A big and lumbering man, Skelton moved easily through the crowd, looking entirely at home among men in farm hats and scruffy boots or VFW berets. His left arm hung useless and limp against his side, a casualty of the childhood polio that robbed him of his West Point dreams. There was just enough strength in his right arm for a weak handshake. But that's not the sort of thing a man talks about in this part of the world, so not many people know the story of how Skelton signed up for a 2-mile race as a 19-year-old sophomore at Wentworth Military Academy. His teammates taped Skelton's left hand to his leg so his arm wouldn't flap as he ran. With his right hand tucked into his pocket, he finished the race, far behind the leaders, yet triumphant. Skelton's loss wasn't his own doing. He had the backing of many conservative groups, including the NRA. He even voted against health care reform. In the waning days of the campaign, he aired a television ad distancing himself from his party's congressional leader. "Ike Skelton: Against Obamacare. Pro-life, pro-gun, pro-military. Doesn't sound like Nancy Pelosi, does it?" the ad proclaimed. It wasn't enough. And so Missouri's Ike Skelton became the reluctant symbol of a historic upheaval. His loss, as VanSant put it, is "the ultimate indication that we're in full Republican mode." See "40 Under 40: The Rising Stars of American Politics."